If you're already a fan of Splatoon, you probably already know most of the important things about Splatoon 2, and you're going to like it. It's generally more of the same, but better. And it's not just a port of the Wii U game; it's a fresh new can of squid (that's a good thing). For those who aren't aware of how Splatoon works... 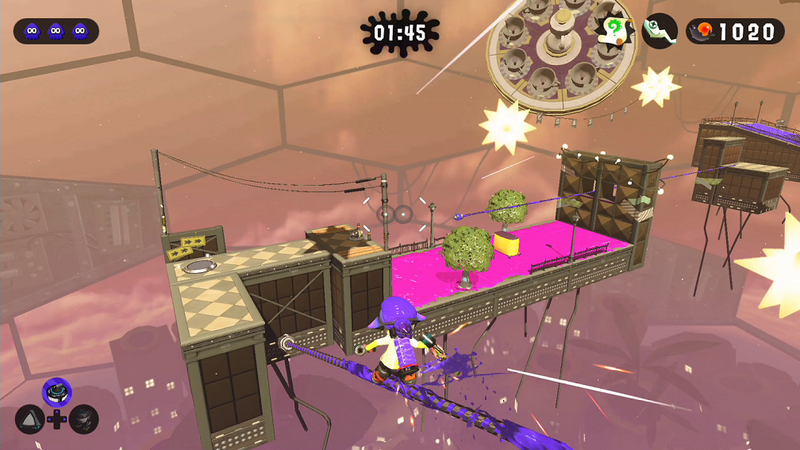 It's a family-friendly third-person shooter in which the player controls an Inkling - an ink-shooting squid-person - which can transform into squid form and swim through its own-colored ink for fast movement across the ground and up walls. The objectives vary across the game's many modes, but to simplify things for the moment, you'll either be using the clever inking gameplay in the single player adventure to do platforming and combat against computer-controlled enemies to progress to the end of each stage, or you'll be playing with teams of real people online and competing against other teams or waves of non-player enemies. I already wrote a preview article about Octo Canyon, and though I had yet to finish the adventure at the time of writing, the opinions and details still hold true now. When I played the first Splatoon, I was blown away by the single-player level design, but Splatoon 2's makes the original feel bland in comparison. The level design is still top notch and satisfying, but there are a lot of new gameplay elements to mix things up this time around, from grind rails to boost pads to orbs you can shoot and warp to. What really adds to the depth though, is that any level can be played with any weapon type (once you've progressed far enough to unlock that weapon type), and each level's completion is tracked per weapon. And for those who aren't familiar, Splatoon's various paint-themed weapons each handle in unique ways and with different combinations of sub-weapons (throwable ink bombs) and special weapons that often totally change up the style of gameplay. Anyway, check it out the preview for more details on Octo Canyon. Seriously, just because this paragraph is a small percentage of the review, don't discount Splatoon 2's single-player mode; it's a significant part of the game and it's fantastic. When you first enter the game, after an unskippable announcement of the current level rotation (each mode is limited to two maps at a time, which rotate out every two hours), you'll find yourself walking around a city hub area. Here you can buy new weapons and gear once you reach the appropriate level, exchange tickets for temporary experience buffs and other bonuses, enter online multiplayer lobbies, create a local multiplayer lobby, scan in amiibo for rewards of gear, music, and screenshots, enter Octo Canyon, and even play an impressively challenging rhythm game in the Sound Test. "I'd better just try this for the review," I thought. And then I played for over an hour. The gear that you can buy to make your Inkling look spiffy also comes with valuable bonus abilities in battle, such as faster ink refilling, stealth when jumping to a teammate's location after respawning, higher swim speed, and many more. Each piece of gear has one visible bonus and up to three additional bonuses which are randomized and unlocked as the gear is used online and leveled up. In the first game, this resulted in a whole lot of luck and grinding if you wanted to get gear that both looked cool and had your preferred strategic set of abilities. This time around, there are couple options to ease the process: bonus attributes can be scrubbed from gear and then reattached to other gear (for a fee of in-game money), and there's a character who sells items which increase the likelihood of a particular bonus being unlocked next. It still seems like it'll take a lot of effort to get what you want, but it ought to make building a strategic loadout more dependent on the player and less about luck. 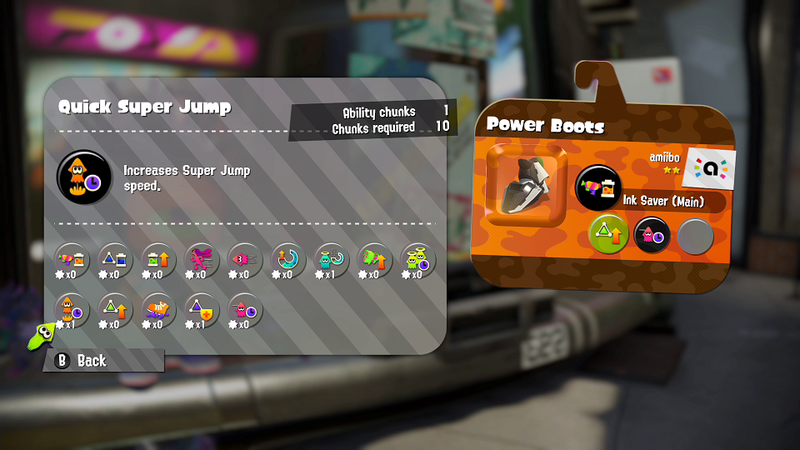 As a beginner, the only modes you'll be able to play are Octo Canyon and Turf War. Turf War is the original, simple challenge of covering more ground in your team's color of ink than the enemy team within the time limit. The simple concept turns out to have more depth than it might first appear, because you'll want to be attacking enemy players at the same time to delay them from covering any more ground, and some weapons are better suited for quickly creating paths for your teammates rather than covering large areas in ink. It often tends to feel like the last 45 seconds is all that really matters in this mode, but what does a noob like me know anyway. Once you've played enough of Turf War to get to Level 10, Ranked Battles become available. These make use of one of three returning modes: Splat Zones, Tower Control, and Rainmaker (once again, one mode at a time and two levels at a time, changing out every two hours). Each ranked mode has slightly more complex objectives, and has had some updates and gameplay tweaks since its appearance in Splatoon. To summarize though, "Splat Zones" matches have two teams fighting over control of a smaller area rather than the entire map, and the winner is whoever can hold the territory for a certain total amount of time. 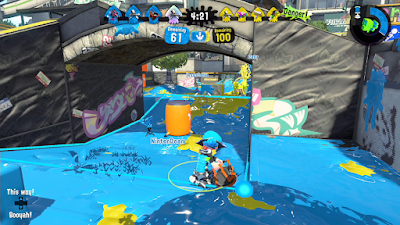 "Tower Control" challenges players to ink and ride a moving tower across the map and push into the goal on the opposing team's side. And finally, "Rainmaker" is a fight to capture a sort of super weapon, the Rainmaker, and bring it into the target area of the enemy team's base. It's kind of like capture the flag, but the flag is a gun. In Splat Zones, team fight to control a much smaller area, so it's extra important to "splat" the opponents. Anyway, since these are ranked modes, winning will increase your rank and losing decreases it. New to Splatoon 2, each mode has its own rank as well, so you're allowed to be bad at Rainmaker without hurting your record for Tower Control. Additionally, if you're able to reach rank B- or higher, League Battles become available. With these, you can compete with a group in the Ranked Battle modes over the course of two hours to try to achieve the highest rank with everyone starting from scratch each time. This way, you once again can play without the pressure of needing to maintain a good record, and it gives players who have maxed out their rank something else to do. Finally, we have Salmon Run, a new cooperative mode where a team of up to four players fights against waves of computer-controlled enemies with the goal of defeating boss enemies and taking their golden eggs back to a repository. 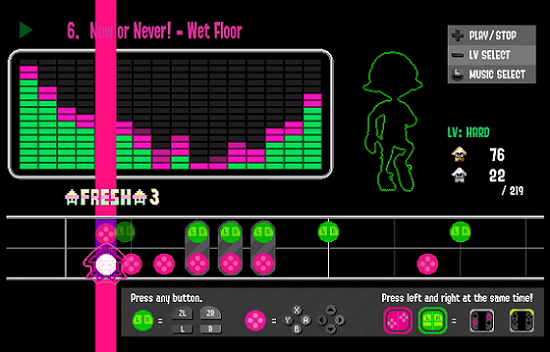 This mode is somewhat randomized each time because players are forced to use a different weapon with each wave, the water level and repository location can change, and the location and type of enemies varies. It can be a challenge, especially with less than a full team, since the game ends if the entire team is defeated or if not enough golden eggs from the boss enemies are collected during the wave's time limit. This mode also ranks you based on your success over time, and rewards you with money and items for reaching certain point thresholds. Unfortunately, this mode is only open during certain time periods for public play, but you can still meet up with friends in real life for local multiplayer and play any mode and any level, regardless of the current rotation on the server. With the game's release, a mobile app will also be available which will allow players to organize teams with friends, voice chat, and order unique gear. Since that's not available yet, I don't know anything beyond what's already been publicly announced. Amiibo can be used once again, and all I know for sure is that the Inkling amiibo from the first Splatoon unlock the same gear they did in the first game, in addition to music for the sound test rhythm game, and the ability to pose your character with the amiibo character in the city for cool screenshots. Another very useful feature of amiibo is that you can store a weapon and gear loadout set, along with your control settings, to an amiibo and then scan it in again to instantly switch to that set. I imagine this would be very convenient for tournaments (though amiibo scanning can be disabled in the local multiplayer options if tournament organizers desire), but it's a bit odd that saving favorite loadouts and control profiles is locked behind amiibo rather than being freely available functionality. 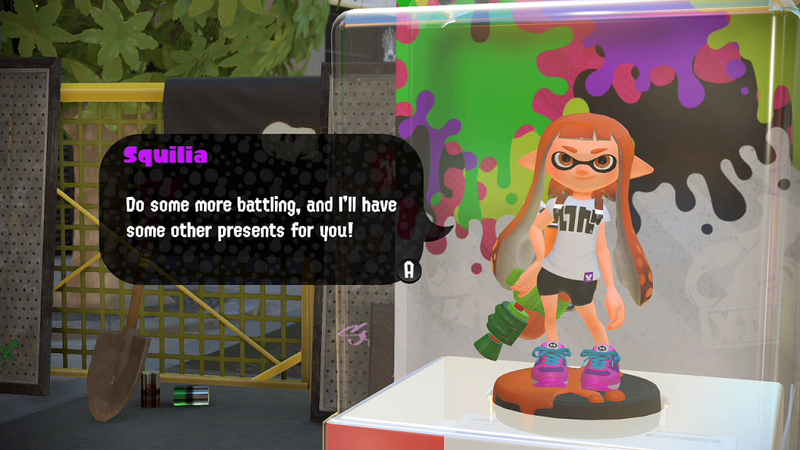 And finally, like the first game, free updates of new gear and stages will be made available over the course of the year following Splatoon 2's release. The number of maps currently available feels acceptable (eight for competitive multiplayer and two(?) for Salmon Run), but having more on the horizon ought to keep things fresh for a while. It's not wrong to say that Splatoon 2 is mostly more of the same, but it's hard not to be without drastically changing what made the first game so fun. 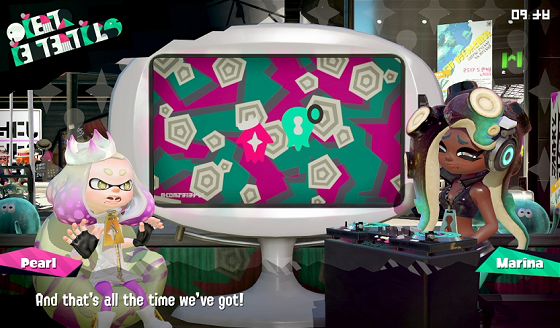 Even though most of the modes are very similar to the first game's, the absence of certain special weapons, addition of new ones, new levels, more convenient gear customization, Octo Valley's many new gameplay elements, and Salmon Run, there's enough newness here to make it all feel fresh again. When all I had seen was the Nintendo Direct announcements, I feared that Splatoon 2 would be more like Splatoon 1.5, but now that I've played it, I'm pleased to have found it worthy of being called a full sequel.